In most programs, you can print a document on any printer that’s installed on your computer or shared over a network. By using the Print dialog box, you can specify which printer to use and can customize the way your document is printed. 1. With the document open in its program, choose Print from the File menu to display the Print dialog box. 2. Specify the printer you want to use. 4. Click Find Printer to find and use a printer on a network that isn’t listed in the Select Printer section. 5. Specify the pages you want to print. 6. Specify how many copies of each page you want. The Selection option in the Page Range section of the Print dialog box tells the printer to print the text or the item that’s currently selected in the document. 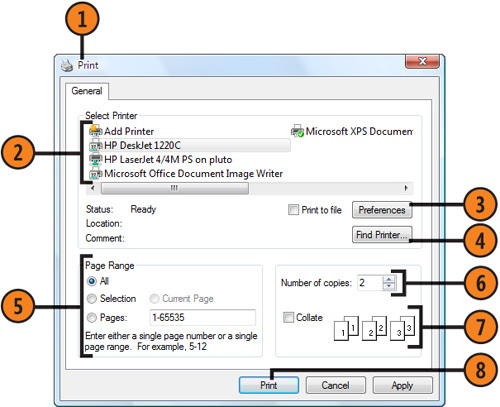 The Current Page option tells the printer to print either the page that contains the insertion point or the page that’s displayed. If the Print command on the File menu isn’t followed by an ellipsis (...), the Print dialog box probably won’t be displayed, and the document will be printed on the default printer using the default settings. When you want to print a document or a group of documents, you can print directly from Windows Vista without having to start the program in which the documents were created. That program, however, must be installed on your computer and will usually be started by Windows. It’s a great convenience to be able to quickly send several documents to your printer and then walk away while Windows Vista does all the work. 1. Open the folder that contains the items you want to print, and select the document or documents to be printed. Multiple documents must be of the same type (all Word documents or all Notepad documents, for example). 2. Right-click a selected document, and choose Print from the shortcut menu. Some programs require the use of the system default printer. To print documents that were created in those programs, you have to either use the default printer or tell Windows to switch the default-printer designation to the printer you want to use. 2. Locate and select the document or documents you want to print. 3. 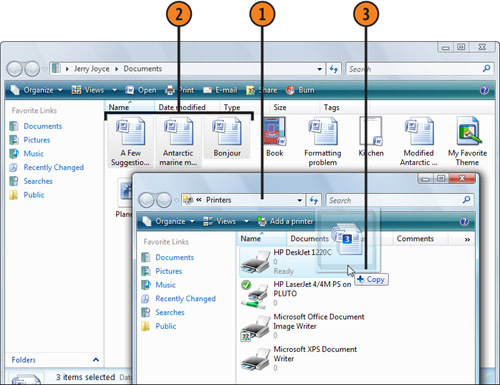 Drag the selected document or documents onto the Printers folder and onto the printer you want to use. 4. If a Printers dialog box appears, click Yes to confirm that you want to print multiple files.